It is Spring Fling Time again! 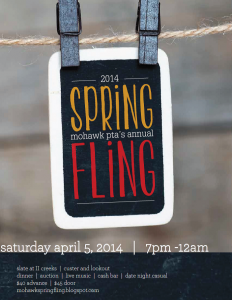 Join the Mohawk Elementary PTA for its annual Spring Fling fundraiser on April 5, 2014 at Slate in the II Creeks shopping center. Tickets are $40 in advance and $45 at the door. Advance tickets can be purchased online at www.mohawkspringfling.blogspot.com beginning March 3. Your ticket purchase includes entrance to the event, food from Shady’s, great music by The Cover Down Band and a cash bar. Something new that we’re doing this year at Spring Fling is a Wine Pull. For $10, attendees can buy an opportunity to select and take home a bottle of donated wine. We are currently collecting wine donations ($10+ values please!). So whether you want to clean out your wine collection or donate your favorite wine to a good cause, we appreciate your donation. If you are interested in donating please email thekessels@tx.rr.com or jessicapillsbury@gmail.com.